December 27, 2014. A couple of days after Christmas, much was still closed, so we decided to go for a walk. 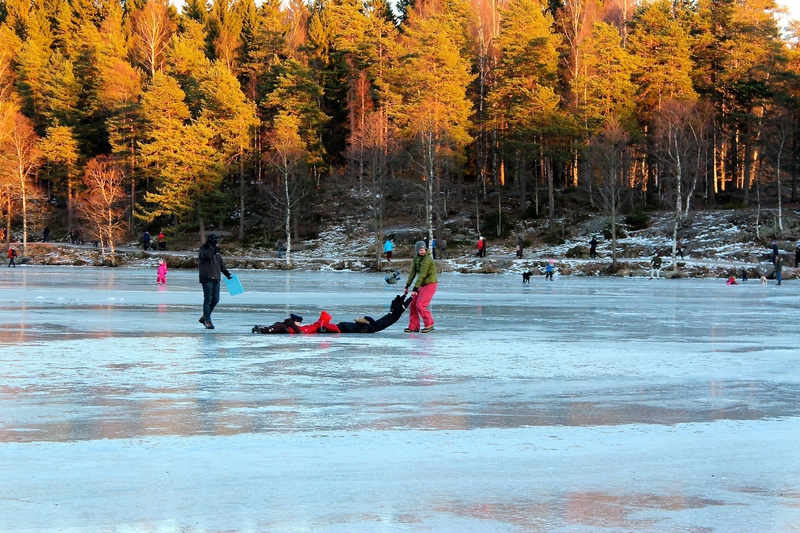 This time we picked Sognsvann, which we’d been told had a lovely lake that you could stroll around, as well as paths for cross-country skiing. 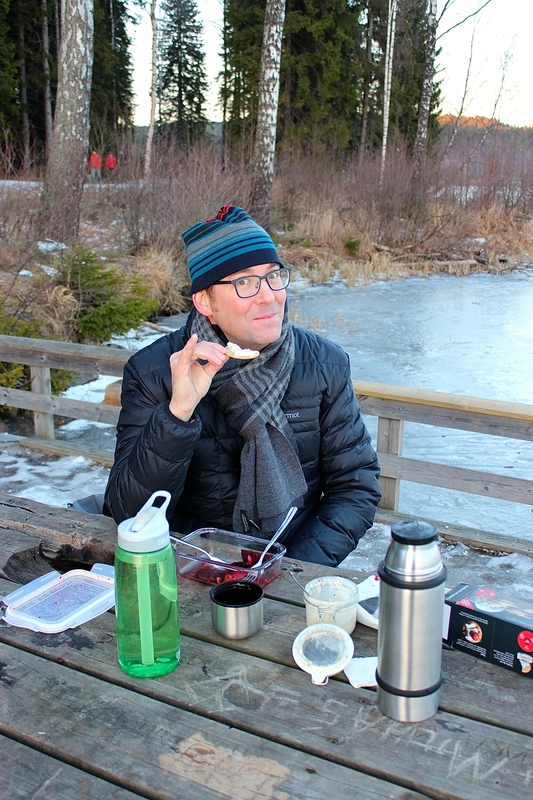 We thought we’d join the Norwegians, who love to picnic despite frigid temperatures, so I packed a lunch of leftover pickled herring and grilled veggies, along with a thermos of hot coffee. Fearless Norwegians on the ice. We arrived and set off for our walk, along with 700 other Norwegians — it looked as if the entire population of Oslo had come out, they and their dogs. We saw dogs pulling kids’ sleds, dogs hauling cross-country skiers, dogs attempting to ice fish. Entire families joined their pets on the thinly frozen lake, with folks figure skating, skiing, playing hockey, forming human trains, and even one misguided soul determinedly trying to light a fire on the ice (seemed like a bad idea to me.) The lack of fear in these people was amazing. Matthew and I ventured out for a short trip on the glassy surface until the butterflies in my stomach got to be too much, then we headed back to shore. Picnicking Norwegians grilling up some pølse. Panting as we slipped and skidded around the icy path, we were impressed with the fitness level and sure-footedness of the crowd. Mothers toting babes fresh out of the womb easily lapped us. Elderly couples in their mid-80s zoomed past with a questioning glance at our snail-like pace. One runner sped by in his bare feet! I kid you not. His. Bare. Feet. Everyone was ruddy cheeked from the wind, but no one was huffing or puffing from the exertion of trying to not to fall. Maybe it’s just years of practice, or maybe it’s in the DNA. As we walked, we passed several encampments where folks grilled pølser (sausages or hotdogs) over fires they’d built from brush. Some families sat directly on the snow-covered ground, using lambskins as water-proof cushions, while others perched on snowy boulders. No one seemed to be anxious for the excursion to end so the blood could return to their feet and fingers. 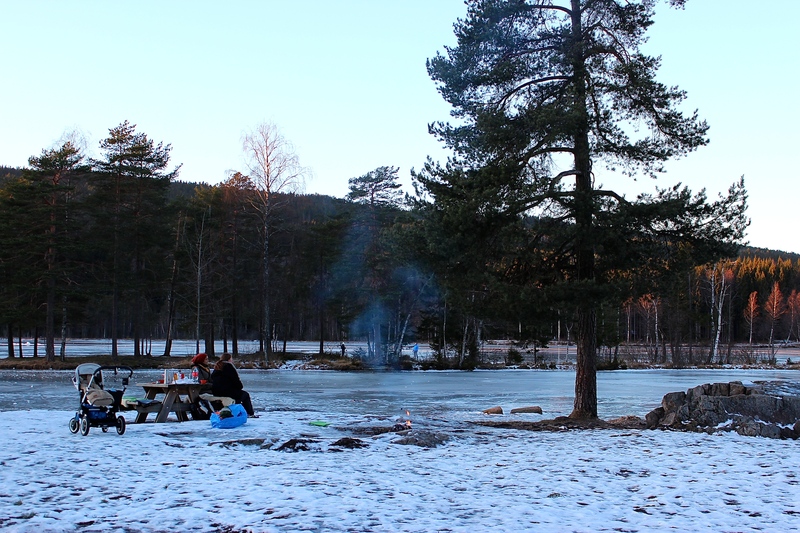 Clearly winter weather doesn’t deter a Norwegian from exercise and enjoying the great outdoors. Pinkies up for pickled herring. After finishing our own meal on a standard-regulation picnic bench (yeah, we wimped out), we completed our tour of the lake, photographing the fantastic hoary frost that had formed on the ground and trees overnight. Then we grabbed a quick waffle and hot chocolate at the ski hut and headed back to the Majorstuen station, where we switched trains and went back up to Frognerseteren. 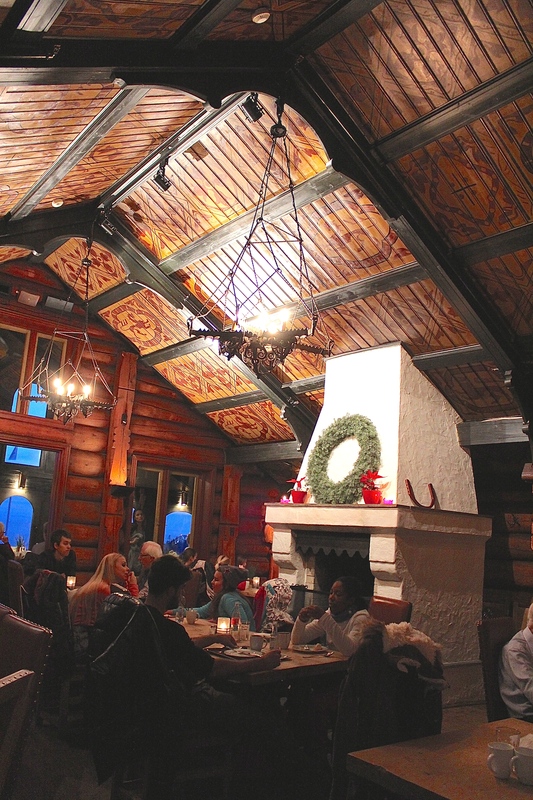 Our goal was to dine at the historic Frognerseteren Restaurant (built in 1891) that we’d spied during our sledding trip. The painted interior of Frognerseteren Restaurant. Sure enough, it was open, and we stepped inside to be enveloped by the warm, rustic interior, complete with folk-art-covered walls and a fireplace big enough to stand up in. I can’t hang enough superlatives on the atmosphere of this place. It felt like a ski lodge, but with a serious Viking flair. Dragons launched from the eaves, rioted on the walls, and cavorted on the carved furniture. I felt like I’d stepped into The Hobbit‘s Lake Village. And the food was tasty, too. Those interested in fine dining will want to make a reservation at Restaurant Finstua, located in a wing of the building, but the majority of the space is dedicated to the casual Cafe Seterstua, which offers a great selection, cafeteria-style. Along with the typical open-faced sandwiches featuring shrimp, salmon, and ham, a host of Norwegian traditional dishes can be had, such as moose burgers, meatballs with creamed cabbage, and pinnekjøtt (pronounced “pinoshet,” like the name of Chile’s erstwhile dictator, which should have been my first clue). This last dish is made from mutton or lamb that has been salted, smoked, dried, and then reconstituted. Despite being told that it’s an acquired taste even many Norwegians can’t stomach, I wanted to give it a shot, since I like to try traditional foods as much as possible. So I took a single forkful … and the best that I can say is that if you love mutton jerky, you’ll love this. I quickly followed up with the yummy meatballs and cabbage, and a slice of apple cake as enormous and delicious as advertised, and went home satisfied, happy, and ready for a nap.